High-stakes standardized testing in public schools is widely contested by parents, students and teachers as a measure of teachers’ accountability, schools’ success and students’ proficiency that at best isn’t accurate and at worst is harmful. Test preparation takes away valuable class time and often pushes out the arts and sciences entirely. This results in a lack of agency given to teachers to teach their own students in the way that would best serve them, and the depersonalization of teaching and learning. Additionally, the tests are extremely biased against students of color and students who are English Language Learners, giving these students and their teachers discouraging and inaccurate measures of student achievement. 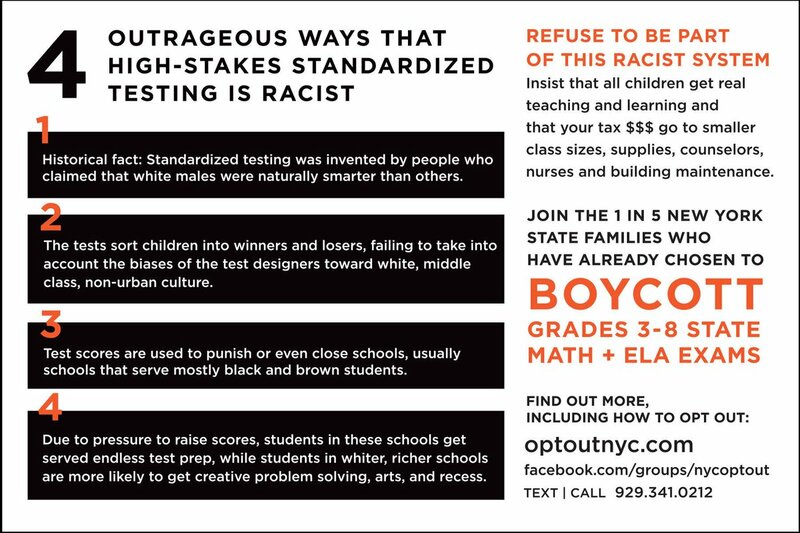 Standardized testing is being protested throughout the US, but this website focuses on anti-testing efforts, also known as the Opt Out Movement, in New York City because of the immense diversity and number of students this public school system serves. The image below was created by New York Allies for Public Education as a resource for parents and relates specifically to opting out in New York. Mostly parents run the grassroots organizations involved in the anti-standardized testing movement, often with the help and support of teachers and other concerned community members. The parents who run these organizations often feel that they’ve been left out of important decisions regarding their children’s education, and teachers feel similarly powerless over the way they must run their own classrooms. By choosing to opt their children out of tests, parents are taking back their power to give their children the quality education they believe in. Much of the organizing against standardized testing is done through social media. Facebook and Twitter are fast and accessible ways to unite people who are passionate about this issue. Parents often use these platforms to ask questions and share information with each other. These organizations also spread resources for opting out, such as test refusal letters, and serve as a platform to announce events where parents can learn about opting out as well as other public education issues through their websites and social media accounts. Which issues intersect with standardized testing? Standardized testing is connected to so many other issues! These tests can lead to disinvestment in poor communities and communities of color, support the school-to-prison pipeline, and increase drop out rates in certain populations. For more information on this, see the image below and the “Research” section of this website. Have these groups had success? According to Elizabeth A Harris’s article As Tests Begin, Chancellor Comes Out Against ‘Opt Out’, the Opt Out Movement had the most momentum in 2015, when over 200,000 students (20% of test takers) in New York state opted out of standardized testing; since then, the number of test takers opting out has stayed consistent at about 19% (Harris, 2018). New York City’s numbers tend to be much lower- last year only 3% of students opted out of the math exam. However, in places where parents publicly resist standardized testing, opt out rates are much higher, such P.S. 321 in Park Slope, Brooklyn, where about 35% of students did not take the test. These groups also have the support of certain people in power, such as city council member Daniel Dromm. He expressed his support of opting out in the letter below. *All of the information in the first 2 paragraphs of this section was taken from Harris’ article. See the “References” section of the website for a full citation. What are the obstacles they are facing? Standardized testing is a huge industry that has become intertwined in the way public schools are run. Even though parents may opt their children out of tests, this does not change the class time that is still spent preparing for the test or the resources their school may lose as a result of the test. Many people in power still remain supportive of tests and thus this system has not yet been disrupted. One such person is New York City’s school chancellor Richard A. Carranza, who has voiced his opposition to the Opt Out Movement; in a recent interview with NY1, he said that opting out of testing is an “extreme reaction,” and “You don’t know, unless you’re able to assess, where students are in the mastery of information.” (Harris, 2018). What has been the impact of organizing for those involved? The Opt Out Movement has given parents some agency over the lives and educations of their children and has connected them with others who feel the same way. Giving parents this power is essential in a system that overlooks them as experts of their own lives and experiences.